Following a critically acclaimed, sell-out season at the Edinburgh Festival Fringe 2017, Brennan Reece is proud to be taking his second full-length show, Everlong, on a highly anticipated tour of the UK this year, calling at the Millgate on Thursday 8th March 2018. Tickets now available. Everlong is a carefully crafted hour of comedy and breathtaking honesty as Brennan applies his unique brand of uplifting storytelling and thought provoking humour to subjects as disparate as the stars (in the sky), memories (in the mind) and his Nanna (in a home). Brennan won English Comedian of The Year in 2015 and was a finalist in the BBC Radio New Comedy Awards, as well as being nominated for the Amused Moose Comedy Awards. 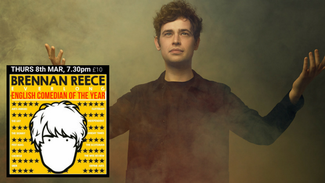 His sell-out debut show, Everglow – a heart-warming autobiographical hour about growing up in the North - was the smash hit of the Edinburgh Fringe 2016 earning him a nomination for Best Newcomer at the lastminute.com Edinburgh Comedy Awards, along with glowing reviews. Brennan took Everglow on the road in a sell-out UK tour in 2016, and has recently supported Rob Brydon, Jason Manford and Nick Offerman. An accomplished actor and writer, Brennan has appeared in Marvellous (BBC), Soulboy (BBC Films), Leaving (ITV) and Skins (E4), and has written for BBC Radio 4’s Newsjack and Show What You Wrote. In February of this year, Brennan will be heard as the voice of ITV2’s new series, Survival of the Fittest which is the highly anticipated new show from the makers of the hugely popular Love Island. Following this, in April he will attending the Melbourne Comedy Festival for the third time before embarking on a month-long tour of Australia.